Rocky Squirrel: Hey, listen up you squirrels! I just overheard House Lady talking to those finches. She's heading out of town! Apparently, she's got some other yahoos staying here and was showin' them how to fill the feeders and water all the plants. Randy Squirrel: WHAT! Did I hear that right? Did she mention us? Nothing about us??? 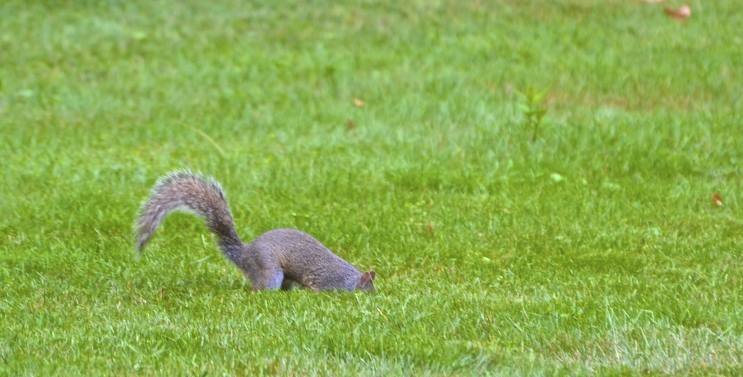 Sammy Jr. Squirrel: Oh no, oh no, what will we do!!! The FOOD will all run out. We'll starve! 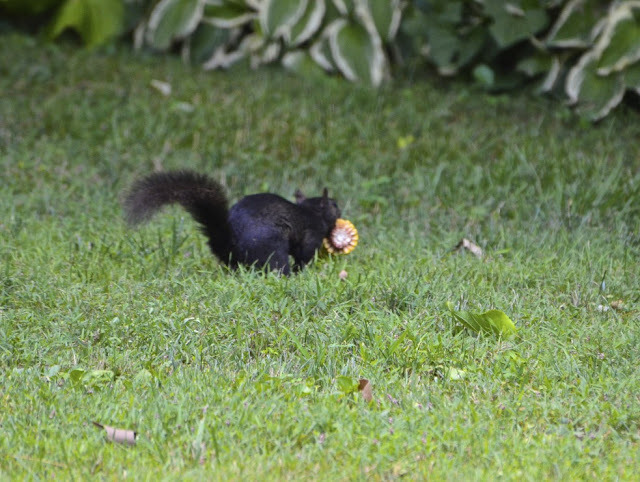 Darth Vader Squirrel: Hey, I better eat as much as I can now ... who knows when we are gonna get any more food!! Roxy Roxanne Squirrel: (shouting) Oh, for heaven's sakes! Will you all just calm down! There is a simple solution if they forget to feed us. Taught to me by my grandmother a few summers back during that dry spell. So watch and learn, boys, watch and learn! Roxy Roxanne Squirrel: ..... where you can bury it! Ta-da! Darth Vader Squirrel: Really! We can do that? Roxy Roxanne Squirrel: Duh! I thought they taught you this stuff at that fancy training school they sent you to. Just flyin' around in the trees and no ground work?? Why they train only you boys, is beyond me. YES! YES! You can carry the corn like that. Darth Vader Squirrel: .... so you carry it like this, right? Hey, that's not so hard! Darth Vader Squirrel: .... and this looks like a good spot! Rocky Squirrel: Well done gang! Now that that's all done, I'm feeling much better. 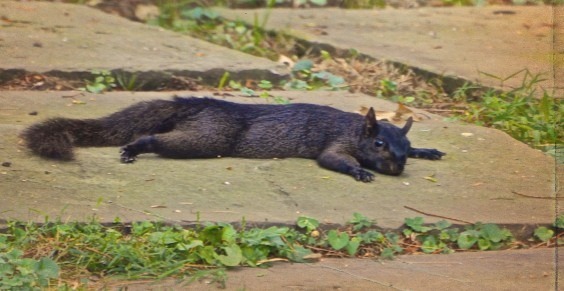 Darth Vader Squirrel: Golly, that was exhausting! I never had to do anything THAT strenuous in my training. But at least now we have some stored away in case those yahoos don't feed us anything. Carmen Chipmunk: (who's been observing all the squirrel commotion) Aha! 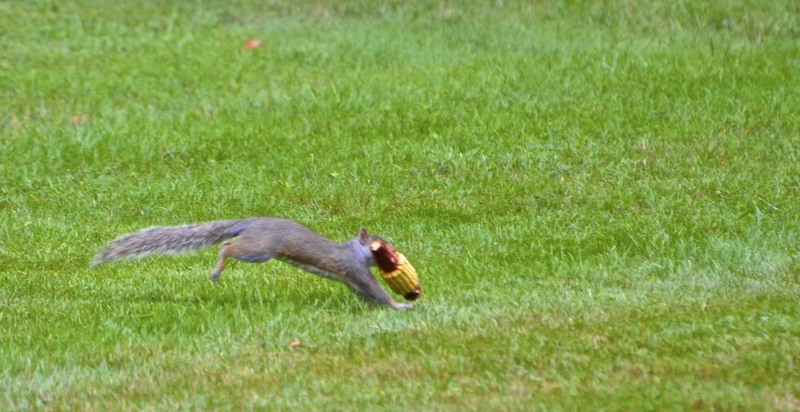 So THAT's what they mean when they say 'squirrel away' ! Mmmmmmmm........ Stupid squirrels. 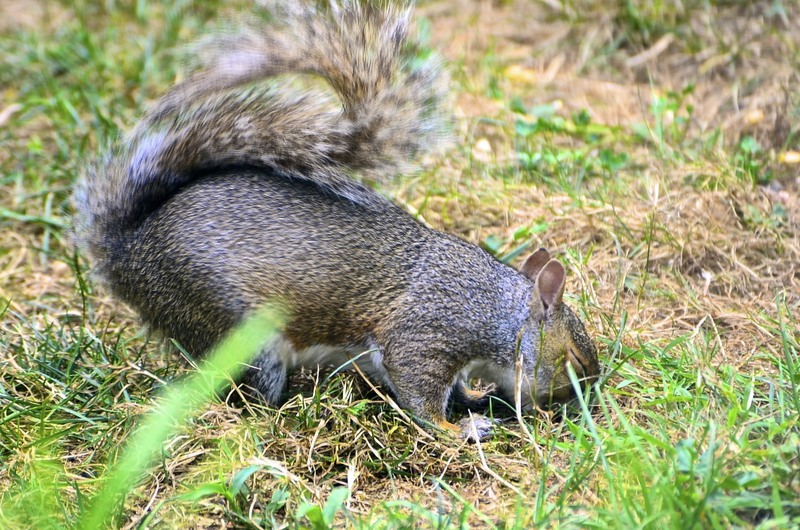 Don't they know I'm also known as a ground squirrel! Now I know where my new food source will be while House Lady is away! Hehehehehe! And now for Human News! We had the Fairy Hobmother select another $50 Amazon gift certificate winner! there and leave a comment on her wonderful blog! And thanks for dropping in. I love reading your comments! Adorable pictures and such an entertaining commentary. I just love it. Enjoy your time away! too too cute!!! 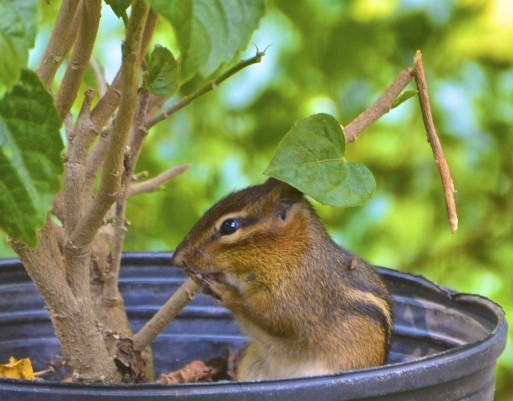 hurray for chippy! Cute! 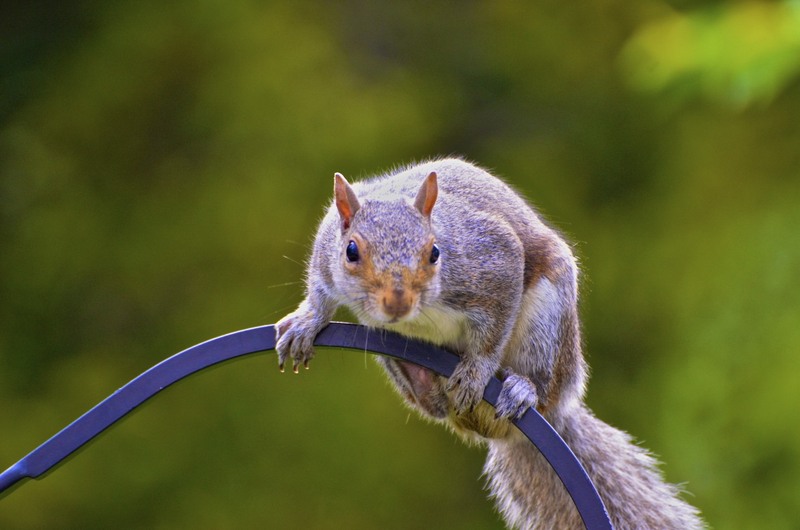 Ya, but stay clear of my birdfeeders. Off limits! Great images. I have never seen one that dark. I love the story just as much as the photos!! I love taking pictures of the squirrels, too. But yours, I have NEVER seen a black squirrel! 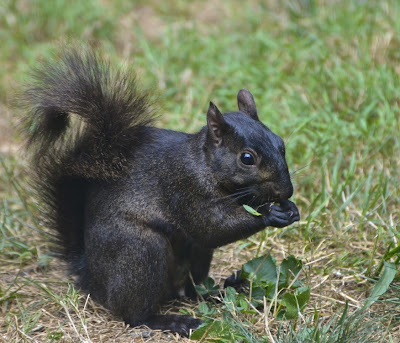 Darth Vader squirrel is a perfect name for him, too. 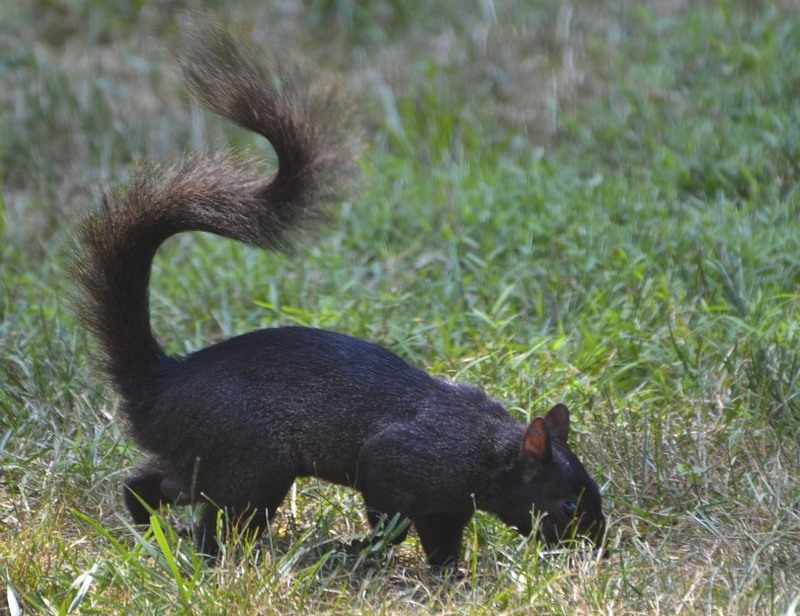 Do you have more than one black squirrel? Are you going on vacation and will not be posting for awhile? The chipmunks are adorable!! 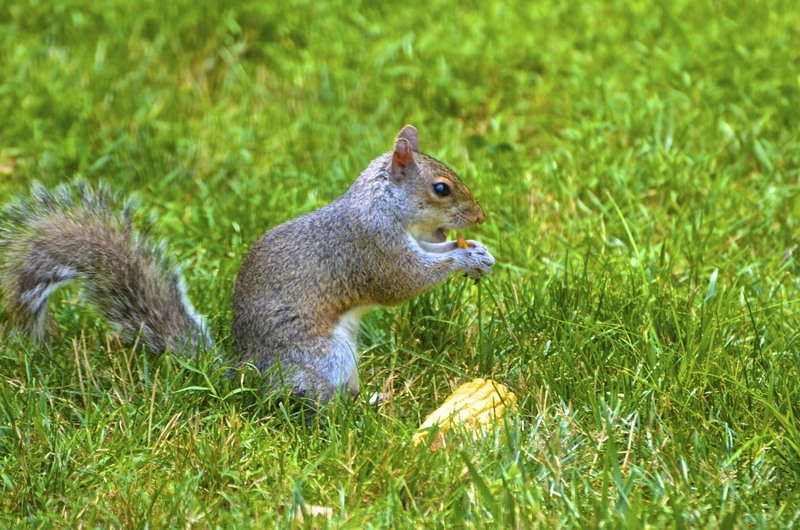 When I was a kid, they would eat peanuts out of our hands, but it took forever, they are much more skittish and cautious than the bold squirrels! Fabulous story and photos. I was sitting on the edge of my seat the whole time. Such cute and fitting names they all have too. That is so funny - cracks me up. Love these happy critters! 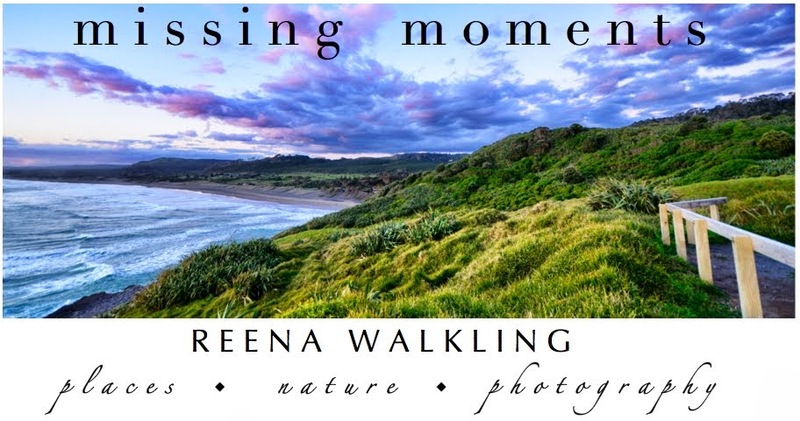 What delightful captures, Reena! Hope all of you have a great weekend!! BOL That was too cuTe!! Loved the darth squirrel!! What a community of squirrels you have!! Such diversity!! Chuckle, chuckle, I love that cheeky chipmunk! Very silly! But very funny! That is TOO funny! Couldn't wait to read the caption for the next picture! That's a great backyard bunch, sorta like we've got here...except for Darth Vader! Hey Darth, may the furs be with you! Great shots and descriptions! So darn cute! Love it! Oh my goodness ~ that is quite a little community going on there. Lots of action. I'm thinking you would be entertained all day! These are such wonderful photos! 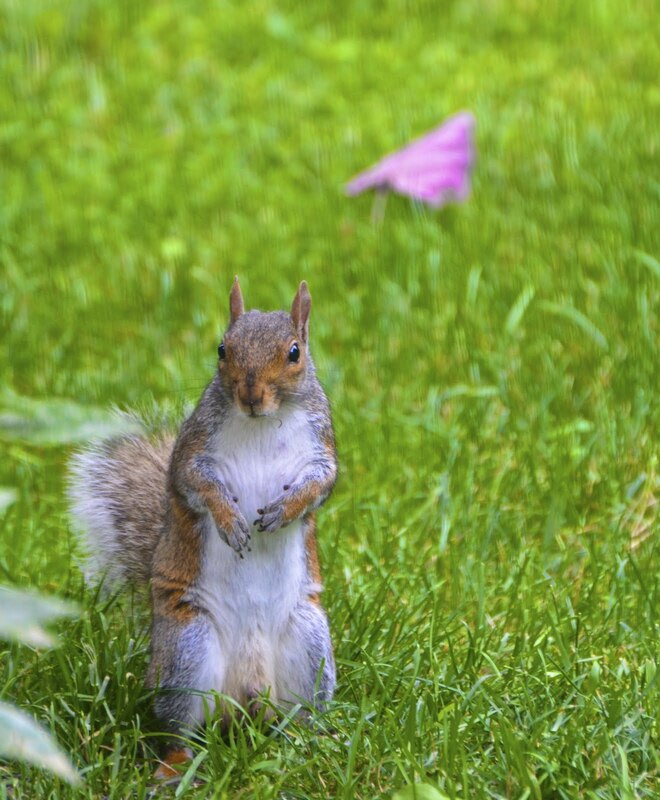 You've really captured the playful quality of the squirrels! Too funny! I never saw a black squirrel before! That was a great picture story! 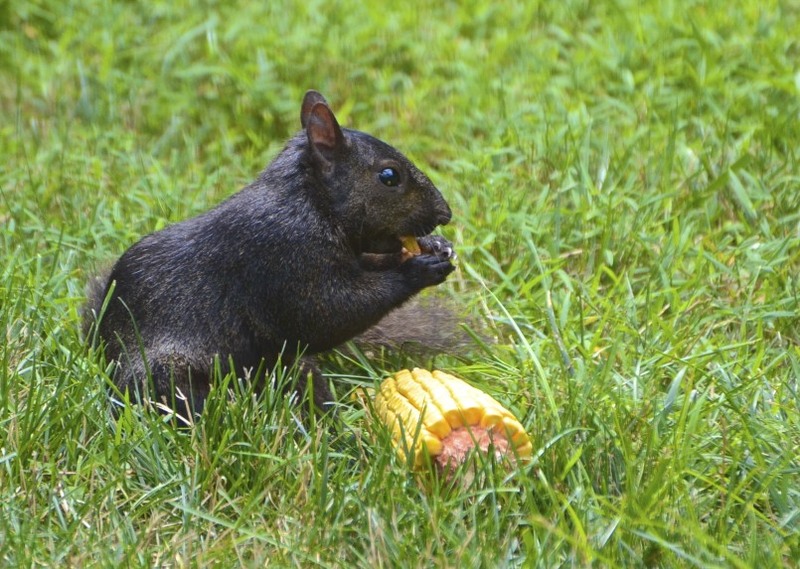 Your Darth Vader squirrel is stunning. 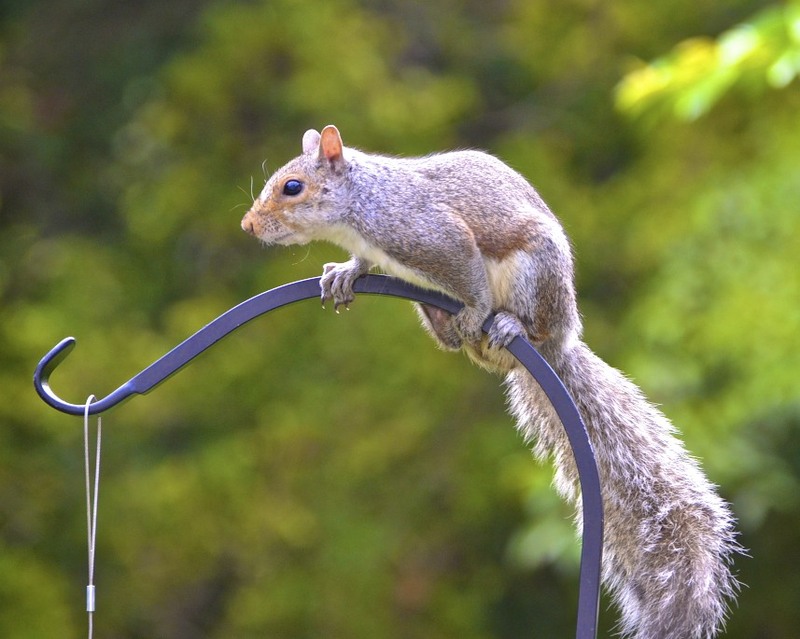 How long has he hung around your feeder? Wouldn't it be great if, by the by, more little Darth Vaders showed up? LOVE this! Rocky looks like he might have a little cameleon in him. You're hilarious, you make me laugh. I get such a kick out of your storyboards! I've never seen a black squirrel before...very cool! We just purchased a baffle (a cone like thingee)that goes on the shepherd's hook about halfway up to prevent those darn squirrels from climbing up and getting the food. So far so good! Have a wonderful vacation and tell the house sitters to keep the doors lock so all the squirrels can't get in. Your squirrels are the best! Have a fun trip. You have that many different squirrels in your yard? I don't have any, but that's ok... I have enough little pest... er... adorable critters. I love this series. Squirrels have always fascinated me: When I was a kid, I used to leave nuts out back for them. One day, I forgot to feed them. At dinner time, my mother freaked out when a group of angry - and apparently hungry - squirrels latched onto the screen door. When I explained why, my mother was not pleased. She laughs about it to this day. 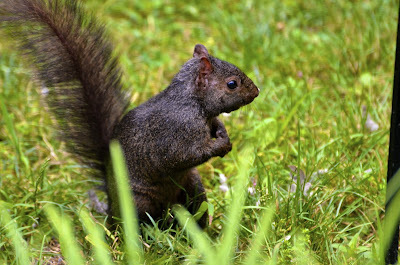 How adorable..I never saw a squirrel that dark..I think I Love him! I did find one with half a tail! Yikes! 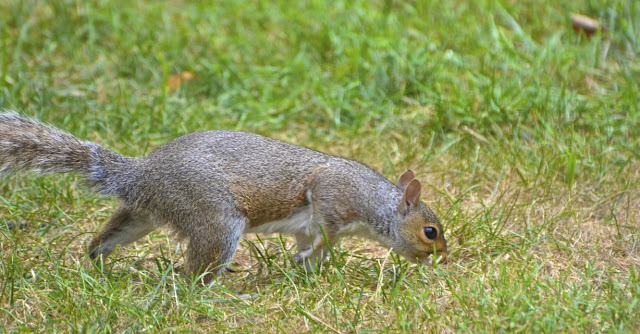 We have our share of squirrels and chipmunks too..wish they'd leave my garden alone! I noticed a neighbors cat in the yead...makes me wonder why I haven't been seeing any chipmunks lately...I thought maybe it was the heat and drought..maybe they were all sleeping in... I keep my cats indoors for that reason, but we have to deal with neighbor cats! A wonderful collection of photos and a lovely commentary !! I love this set Reena! So, so funny! Thank you!! Hahaha, so cute. I love Darth Vader Squirrel. Forgot to say hope you have a safe and lovely trip! I love your photos and accompanying commentary. I will check here often for the beauty of the photos and the entertainment! Thanks.